If the city gets an OK from pending legislation, it could move forward on a community-scale solar farm. 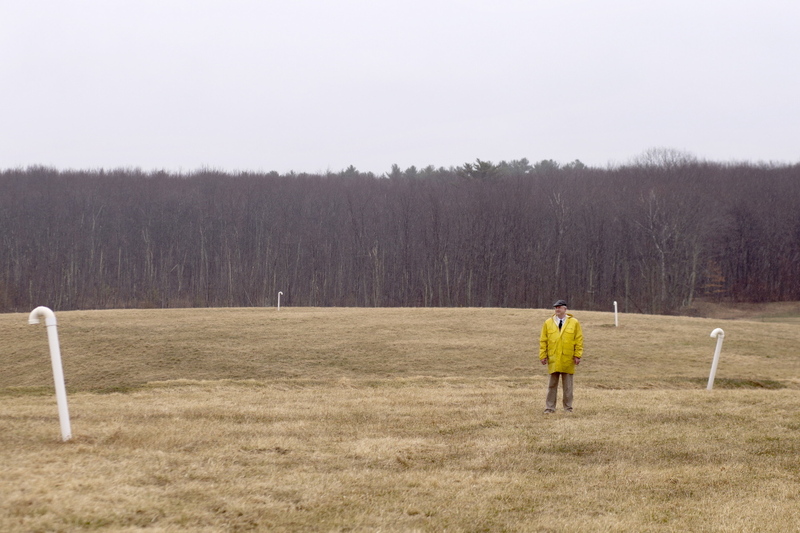 SOUTH PORTLAND — Undaunted by drizzling rain, Tex Haeuser climbs the man-made hill at a good clip, eager to show off the city’s former landfill. Stretching to the east, behind the solid waste transfer station on Highland Avenue, the rolling, 34-acre field is dotted with white plastic pipes venting methane gas produced by the buried garbage. Nothing can be built on the capped landfill that might damage it. Haeuser, the city’s longtime planning director, sees nothing but potential. 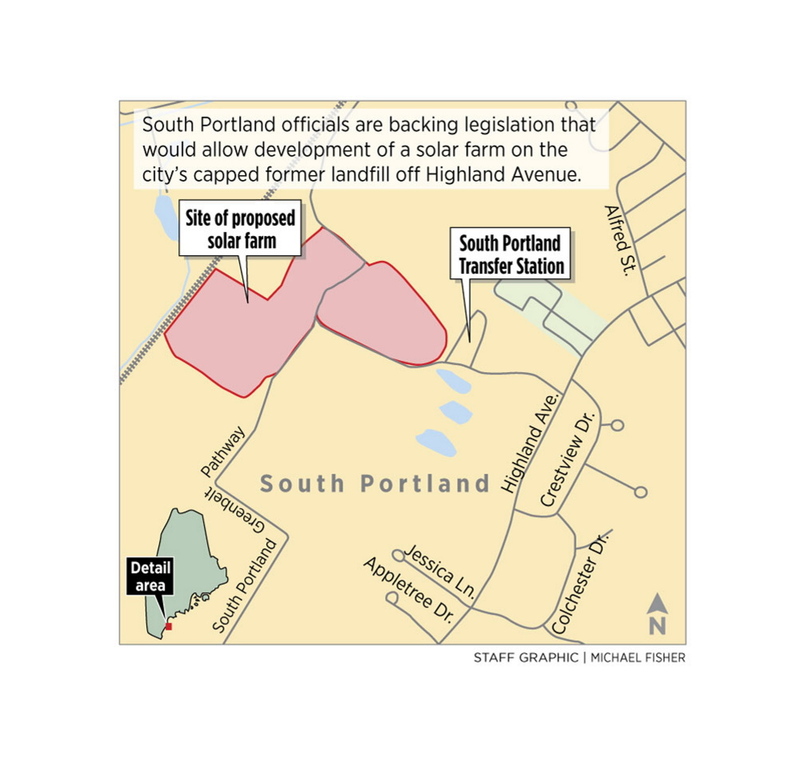 If pending legislation is approved, South Portland could finally move forward with plans to develop a solar farm on the landfill. One of Haeuser’s pet projects, the farm could supply electricity to 150 homes to start and as many as 600 homes if fully developed, with the possibility of connecting to nearby businesses. Haeuser knows the legislation faces tough opposition from Republican Gov. Paul LePage, Central Maine Power Co. and other adversaries, but he remains hopeful and committed to promoting solar development in Maine, especially on this mostly barren hillside in South Portland. The city has been investigating its solar energy options for more than two years as part of its Climate Action Plan. The proposal for the landfill, which closed in 1987 and was capped from 1998 to 2000, was developed by ReVision Energy, a Maine-based company that installed solar panels on the city’s planning department in the former Hamlin School building on Ocean Street. A recent geotechnical assessment of the landfill conducted by TRC Environmental Corp. of Augusta found that it’s suitable for a solar installation. The Legislature is reviewing several bills this session that are related to solar power and renewable energy, including L.D. 1263, sponsored by Democratic Rep. Sara Gideon of Freeport. It would require 2.5 percent of Maine’s electricity mix to come from solar by 2022 and offer new financial incentives to help homeowners and businesses pay off solar installations more quickly. Those incentives could help reduce the payback time for a typical home solar system in Maine from 14 years to eight years. The bill also would lift a cap that prevents more than 10 users on a larger solar power system and allow 50 or more users, paving the way for community-scale solar projects like the one proposed in South Portland. Without the cap, power generation capacity at the proposed solar farm could be sold or leased to city residents, Haeuser says, making it easier to finance the three-phase, $6 million project. Haeuser was among about 75 supporters who turned out last week for a legislative committee hearing on the bill. He testified along with officials and residents from Portland, Freeport, Brunswick, Gouldsboro and other communities that are promoting solar energy projects. At the same hearing, utility representatives, the Maine Office of the Public Advocate and the Maine Energy Office warned that the proposal could increase electricity rates. A CMP representative estimated that ratepayers would be paying $55 million in solar subsidies by 2022; he also questioned why Maine doesn’t allow utility companies to develop solar power as other states do. Haeuser anticipates the development of utility-scale electricity storage options and a smart grid system capable of handling complex energy flows from multiple sources. He believes the pending legislation would open the door to more companies like ReVision Energy, create jobs in an industry that doesn’t pollute and promote an energy source that will become more cost- effective over time.